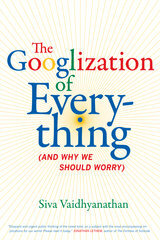 In the latest UC Press Podcast, Siva Vaidhyanathan, author of The Googlization of Everything (And Why We Should Worry), examines the way our culture has used and embraced Google, and explains the insidious effects of Googlization on the way we think. Vaidhyanathan, a professor of Media Studies and Law at the University of Virginia, takes a critical look at initiatives like Google Books and Google ads, spaces where Google’s preeminence may pose a threat to both democratic and free market values. Vaidhyanathan has a busy roster of events this Spring, including appearances at Harvard Bookstore, SXSW, the Library of Congress, and Elliott Bay Book Company. Check the “Events” tab on his book page to see if he’ll be traveling to your area. You can also keep up with him via Facebook, Twitter, and his website. Learn more about The Googlization of Everything in these interviews with Publishers Weekly and Inside Higher Ed. Don’t want to miss an episode? Subscribe to the UC Press Podcast series through iTunes or RSS. You can also listen to individual author interviews at our podcast page.